Tired of talking too many big sports watches, today I went to our watch market in Zhanxi Road to find some new faces. When I walking on the front of ZF store, I talked with them and wanted to hear some big moves they will take in next months, unfortunately, it is near the end of 2018, ZF will stop researching and developing new watch-making technology to publish breakthrough models, they are waiting new watches release from 2019 Basel and SIHH. 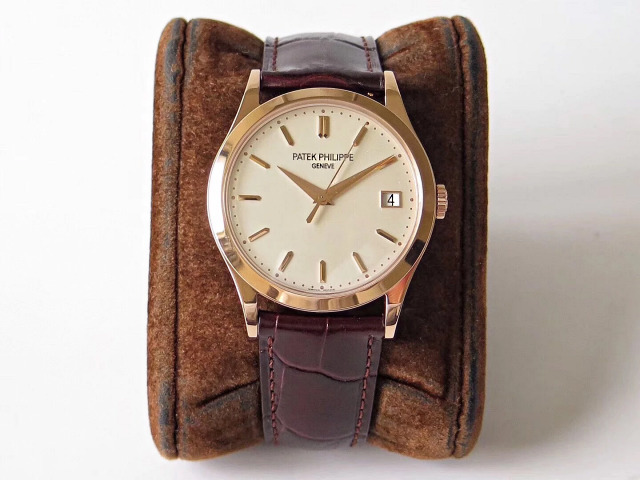 And at the same time, their boss showed me this Patek Philippe Calatrava replica watch. I am not surprised, the watch has a very common outlook, but when I knew its price, I am a little surprised. 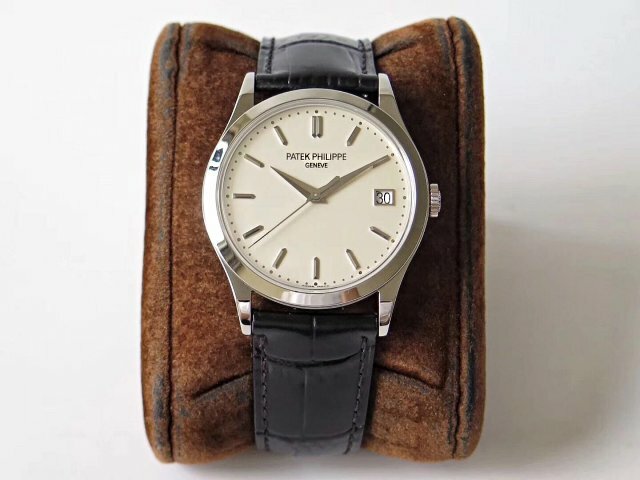 The replica watch is sold at much more expensive than any other dress watches like IWC Portuguese 7 Days Power Reserve and Rolex Oyster Perpetual from AR factory. I do not know why it is sold at a such high price, but when I touched its case and checked its movement decoration, I found this replica belongs to a top quality art work. 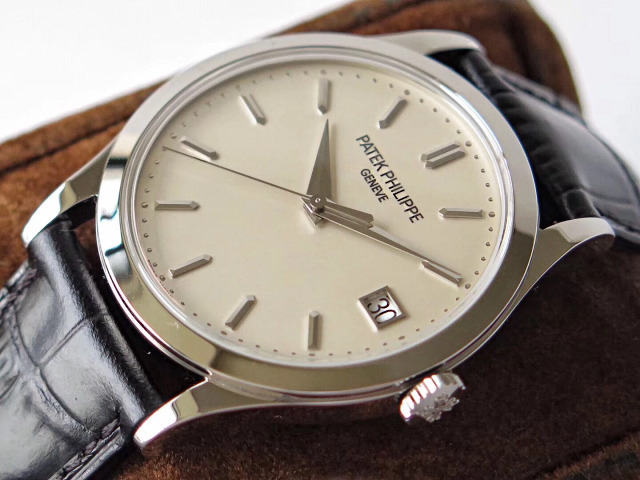 ZF published three models of replica Patek Philippe Calatrava 5296G, please look at the photos. They are stainless steel with black leather strap, rose gold case with brown leather strap, stainless steel with brown leather strap. Each model has a large stock available. 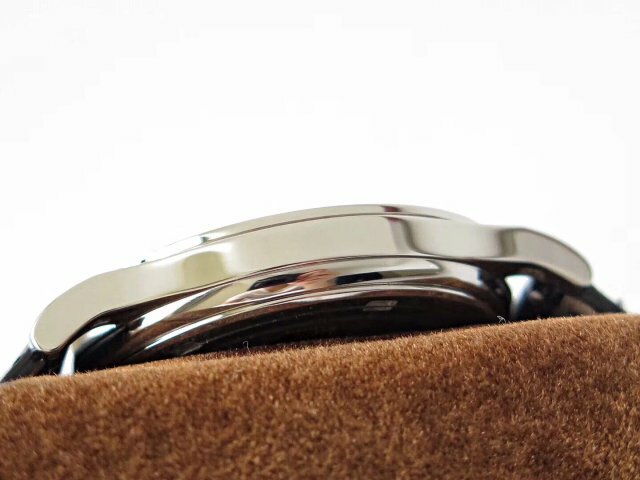 The case is 38mm in diameter, it is only 9mm thick, so I believe it is an ultra-think automatic watch. 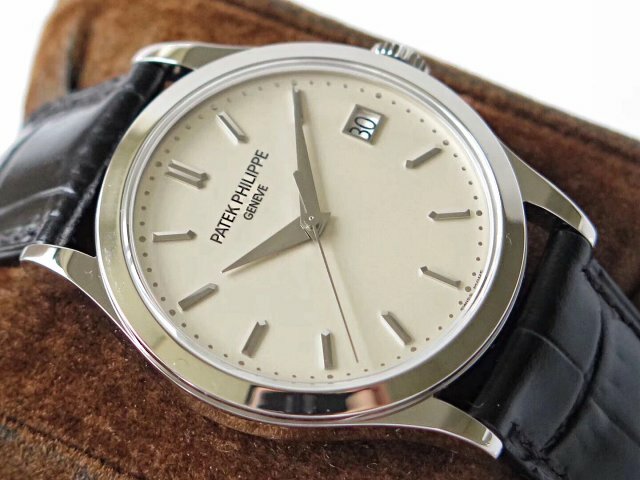 The case size makes the watch very suitable for most people, compared with IWC Portuguese 7 Days, this Patek Philippe Calatrava 5296G is more suitable to become your dream watch because it is so simple and elegant, the simple design and function bring an extreme stability for this replica watch. The case is fully polished with round smooth bezel. 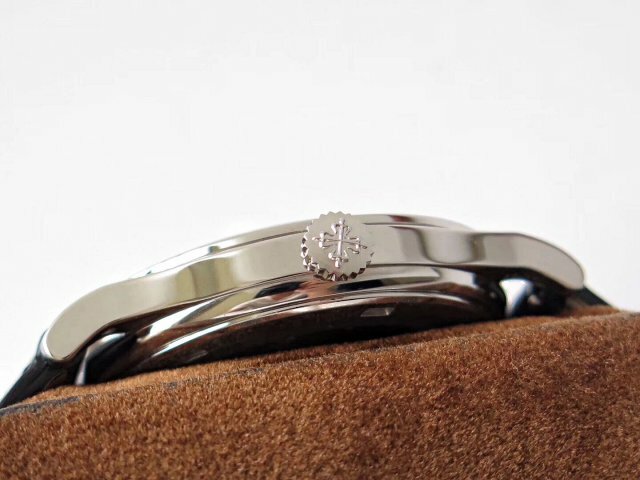 Case back is see-through crystal, like genuine watch, you will see delicate engravings on each lug’s back side. 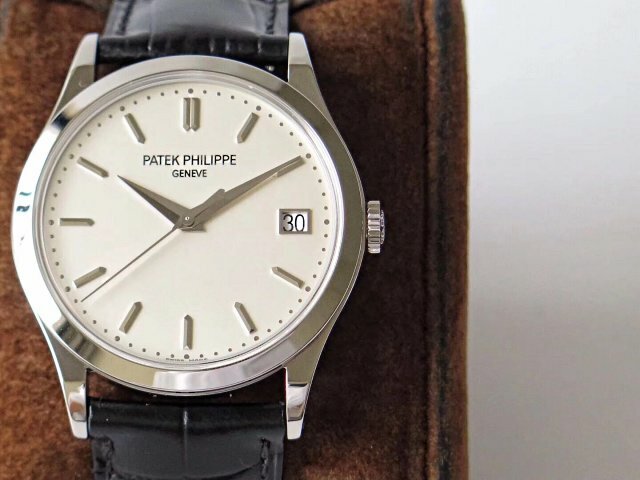 Look at the dial, it is not off white, while in ivory color. Stick hour markers and hands are in silver white, the window opened at 3 o’clock is showing current date in black font. It is these hour markers and hands that exactly reflect the high-level manufacturing process of ZF factory. The movement is a clone PP Cal. 324SC, which is based on genuine Japan Miyota 9015. 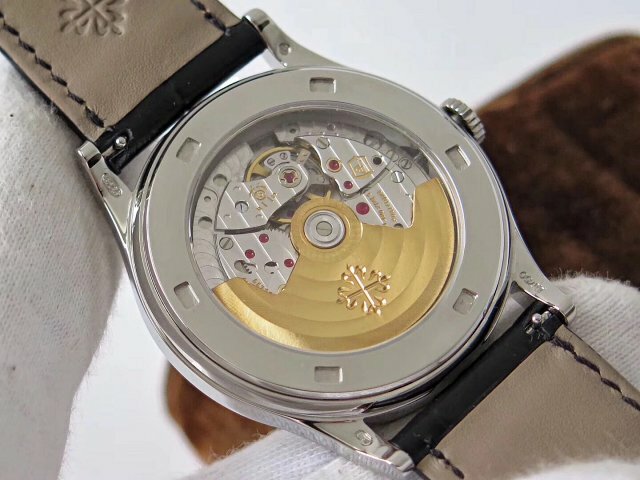 In my opinion, Asia ETA 2834, 2836 and Miyota 9015 are the most stable and accurate three movement used in replica watches. ZF factory bought Miyota 9015 from Japan and made some modification, the balance wheel is placed in a right position, the movement plates and auto rotor are 1:1 decorated according to genuine Calibre 324SC. 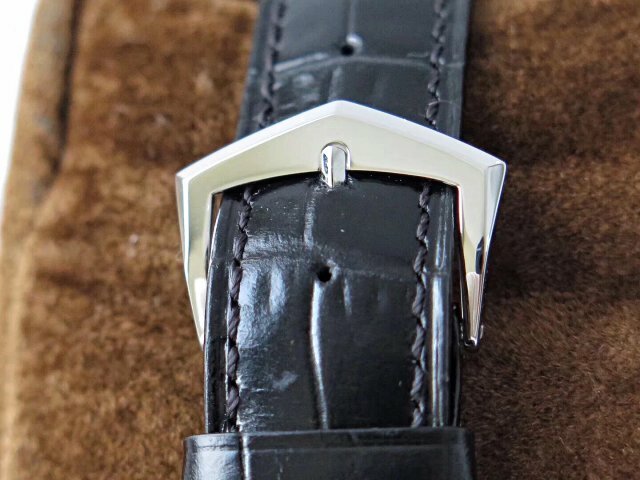 The replica is equipped with a black leather band, which is made of genuine calf skin leather, the leather band has a high quality textured embossed croc print. 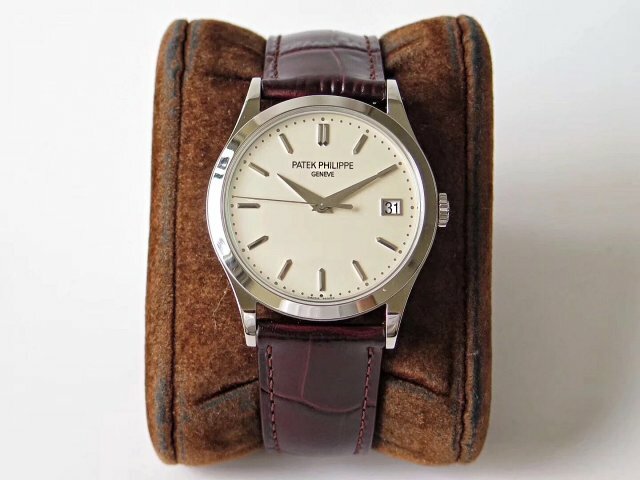 This type of leather strap has a long life that could serve you for more than five year. Hello, I am Susan, your old friend. 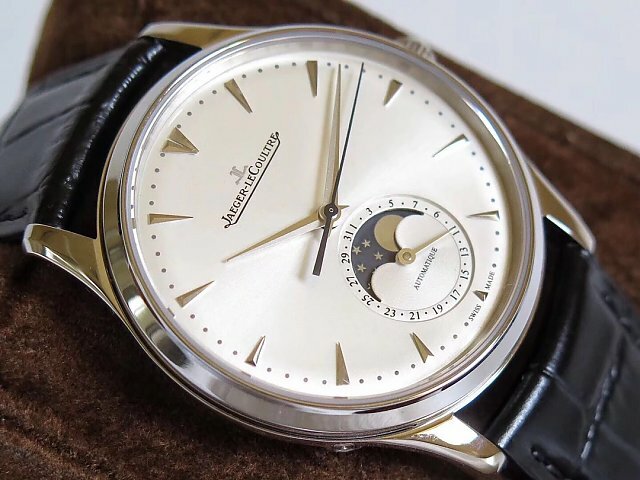 Moonphase watch is one type of dress watches, which has a very considerable sales amount each year, especially Jaeger LeCoultre Moonphase. 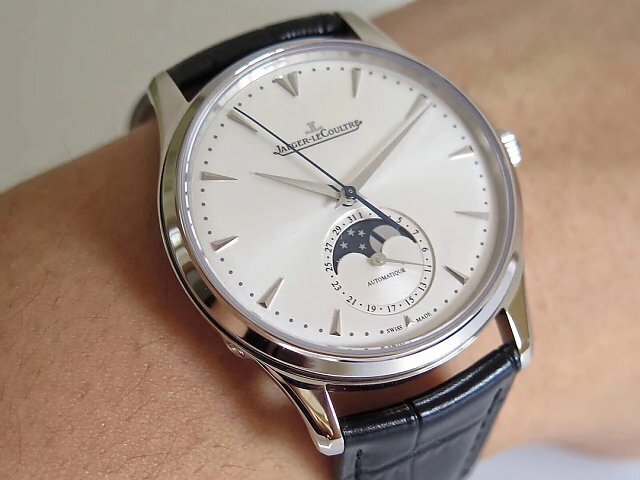 However, the price of each Jaeger LeCoultre Moonphase is very expensive, usually between $18000 and $2000 USD. 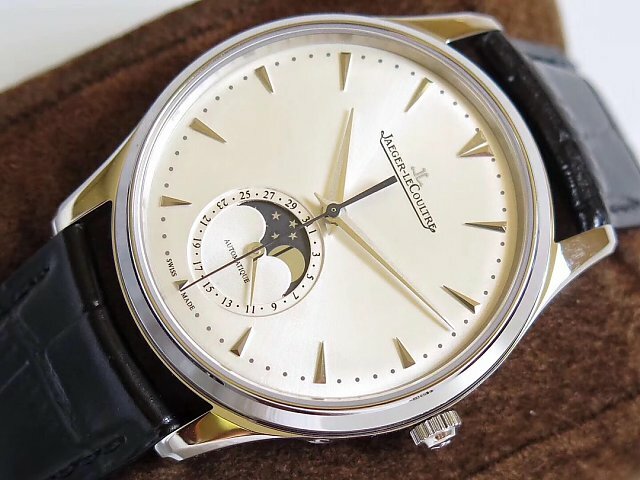 Today, I will introduce one replica of Jaeger LeCoultre Moonphase watch, its genuine watch reference is 1368470, the replica is made by ZF factory, actually this Jaeger LeCoultre watch has a replica made by VF, but after reading this review, you will find ZF Jaeger LeCoultre Moonphase has a higher imitation level. In 2018, ZF is a very hardworking factory and published a lot replica watches that cover each Swiss watch brand. For their best-selling models, ZF will also improve them and release higher editions once in a while. ZF is a very powerful manufacturer, their ranking in replica watches market is next to Noob, for some special watch like IWC Portuguese, ZF made the best replica. The replica is made of solid 316L stainless steel, case diameter is 39mm and it has a thickness of 9.9mm, which is the same as genuine. The polishing on the case is smooth and has a delicate texture. 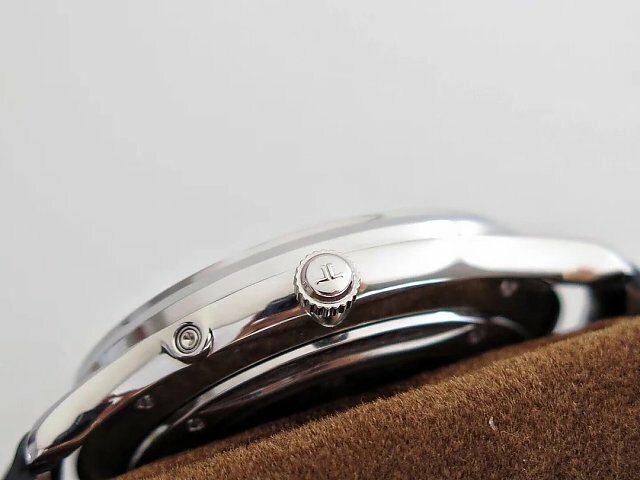 On the left side of the case, there is a round button for the wearer to adjust moonphase. 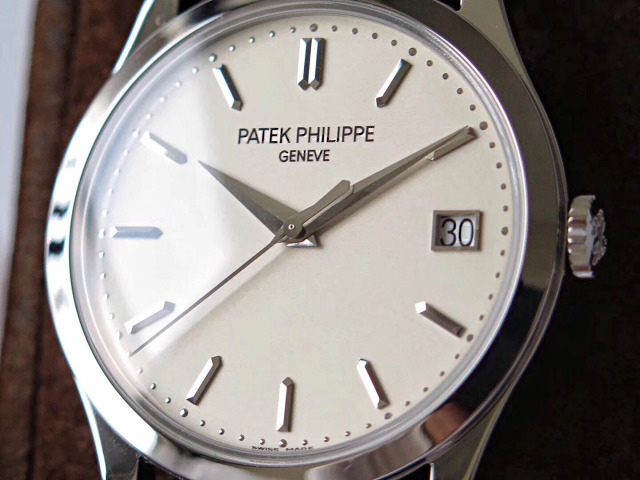 White stainless steel case and silver dial highlights each other. On silver dial, the moonphase display is real, it changes monthly as the genuine, not like other cheap replicas that change daily. All hour markers are arrow-shaped, like hands, they are polished very well and have obvious edges and corners. 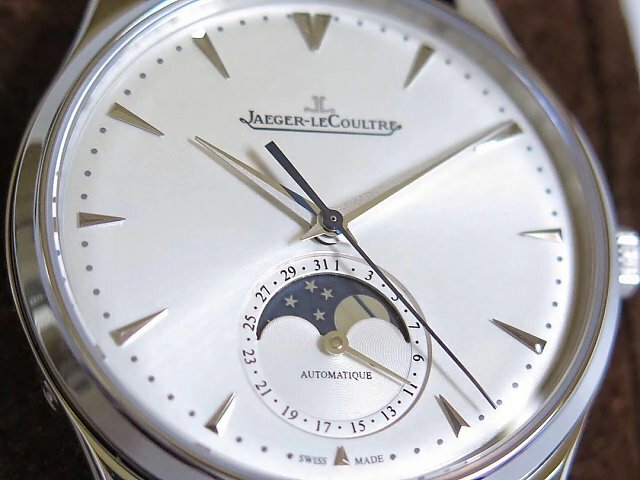 Silver “JL” logo at 12 o’clock is three dimensional, the small dial positioned at 6 o’clock is display moonphase, while the small silver hand is pointing at current date. Crystal on the front and back is sapphire that features AR Coating. 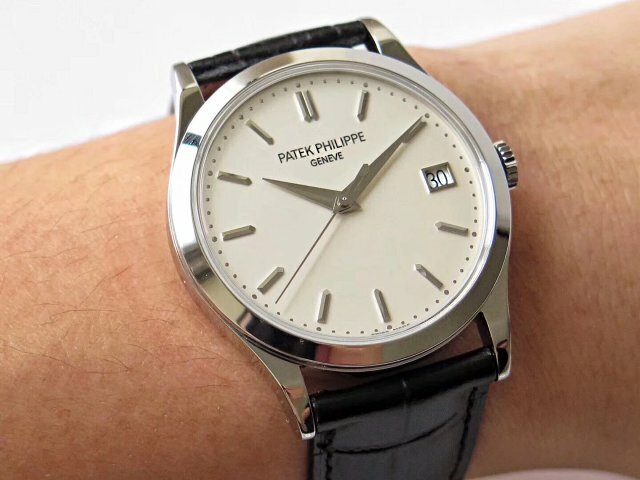 By the way, the slender second hand on the center is in blue color, which makes the whole watch look more elegant. Through sapphire crystal, you can clearly see the movement. 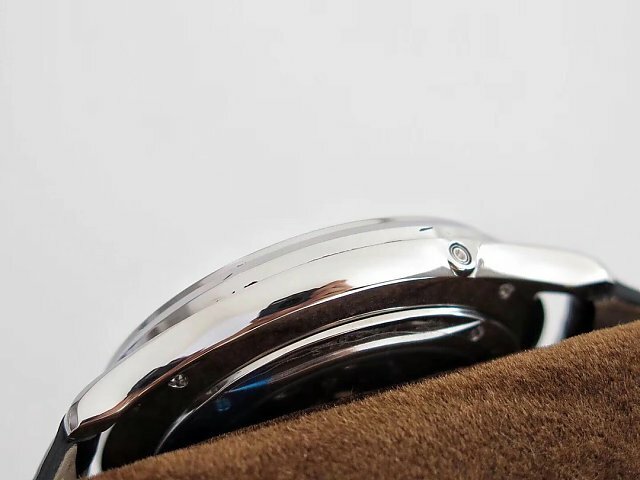 The gasket behind the case back enhances water resistance of the replica, the screws that fix the case back could be interchanged with those of genuine watch. 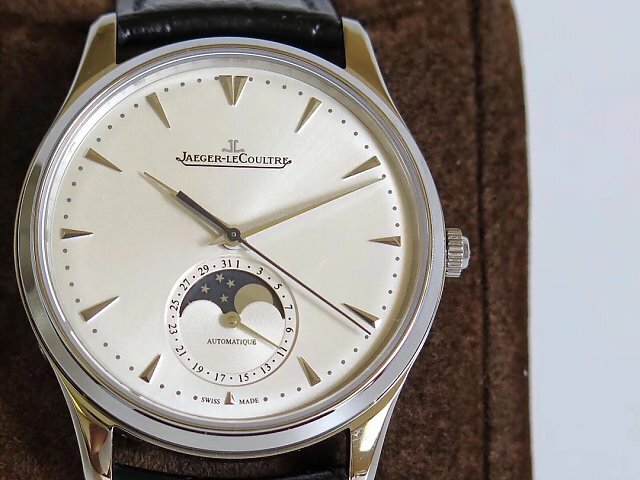 The Jaeger LeCoultre Master Ultra Thin Moonphase replica is equipped with a genuine Miyota 9015, which is then modified by the factory according to genuine Jaeger LeCoultre Cal.925. This clone movement has 100% the same functions as original Cal. 925, it works accurate and stable. 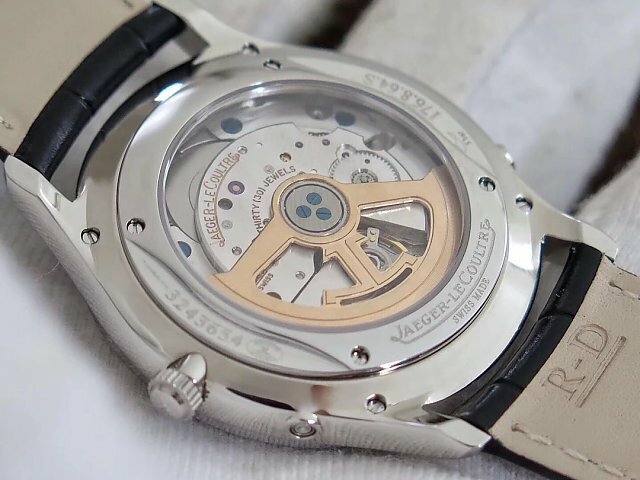 Through transparent crystal back, you can see that A925 movement has a fine polished auto rotor. Black leather band on the replica is made with imported calf skin leather, the leather straps have top hand stitching, with a deployant clasp. 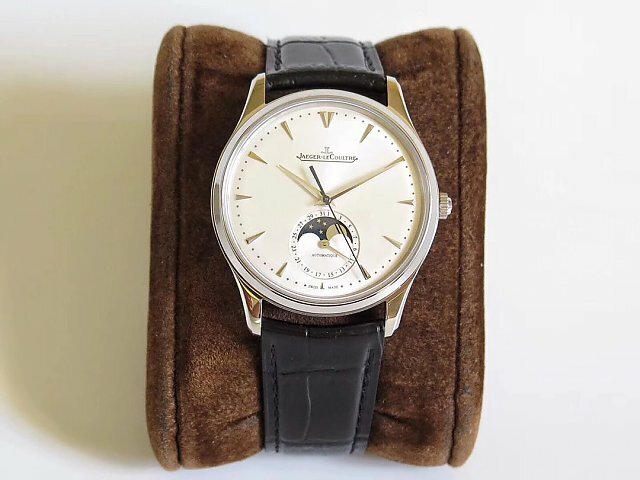 Overall, this replica Jaeger LeCoultre Moonphase watch is definitely worth buying, reliable movement, simple and elegant outlook, practical moonphase function like genuine, these features make it become one of the best-selling moonphase watches in the market.